Bob's love of teaching has resulted in three Excellence in Teaching Awards (1997, 2002, 2005) and an Honorable Mention citation (1999). The central goal of his varied courses is to place American culture in a broader context, often within the Global Studies major and minor, the former Comparative Cultures major, and the Cultural Anthropology minor. Among his courses are Cultural Anthropology, Intro to Global Studies, Language & Culture, Violence & Culture, Health & Culture, Human Origins, and too infrequently, Dogs, Cats, Horses, and Us: Companion Species and Human Culture. His favorite course is on the exotic culture of the Nacirema, in other words on America itself. He has taught honors seminars on topics such as Alternative Healing, Africa & Africans, and in 2005, "Nip, Tuck, Perm, Pierce, and Tattoo: Adventures in Embodied Culture," which received national attention. During the new Allen Term, he has taught "Online Online: Weblife and Its Effects" exploring the consequences of our extensive time spent online. Alumni/ae, students, faculty, and friends participate in the public Facebook groups he created: "Global Studies & Comparative Cultures at Alfred University," "Naciremaland," "Sound Sense Symbol," "Violence & Culture," "Embodied Culture," "Origins: Primates, Evolution, and Race," and "AU Sante." He encourages anyone interested to join these groups, and to follow him on Twitter @anthrofun or Instagram as myersram. Bob enjoys writing for a larger public. His op-eds have appeared in newspapers throughout the nation on American cultural topics ranging from the variety of marriage patterns, curling, barbecuing, ball sports, Santa Claus, movie ad hype, and weathertainment, to youth violence, hazing, fun, the violent language of "gunspeak," the college scholarship search, and the semantic impact of 9/11. In addition, he compiled lengthy annotated bibliographies, Dominica, Nigeria, Ghana, and Mali for ABC-Clio Press, Oxford, England, as well as scholarly articles on health, migration, cannibalism, and circumcision. His major areas of interest concern contemporary U.S. culture, especially fun, violence, and fear as cultural themes. Articles on "Gunspeak" and on "Nuf and E-Nuf among the Nacirema" [Fun and Funny among the Americans] appeared in Reflecting on America (Clare Boulanger, ed., Allyn & Bacon, 2008); his article "When Worlds Collude: Groundhog Phil Meets the Super Bowl on Candlemas" is in the 2016 2nd edition. He has studied the cultural construction of weather information and its effects on us and American anxieties about liminal bathroom space. An interview and article about Bob's focus on "gunspeak" was broadcast on NPR/PRI by WGBH in June 2016, and his "Trigger Happy with Gunspeak" was published Nov. 8 online by the American Anthropological Association in its series on Mass Shootings. In 2017, sapiens.org published his commentary on the anti-wrinkle cultural-industrial complex, "The Making of a Wrinkle Convert." Traveling with an AU group to Missouri to the August 21, 2017, total solar eclipse prompted his "The Great American Cultural Eclipse" in anthronow.com. "That Most Dangerous, Sacred American Space, the Bathroom" is forthcoming in Anthropology Now. In addition to two years on a Fulbright Senior Lectureship at the University of Benin, Nigeria, Bob has conducted fieldwork in the Caribbean (Sint Maarten, Jamaica, and Dominica), West Africa, and the United States, has spent brief periods in the Netherlands and Turkey, and while in college, studied abroad for a year in Marburg, Germany. He examined "Comparative Slavery" during an NEH Summer Seminar with Orlando Patterson at Harvard. 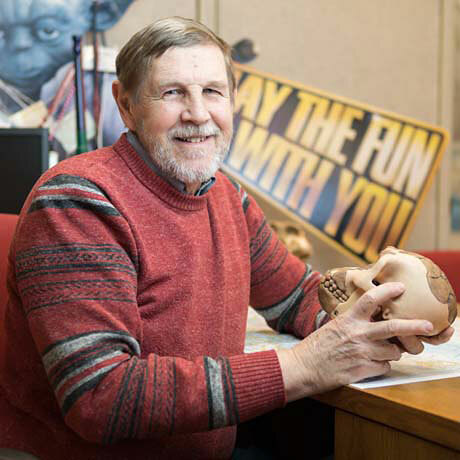 At a national level, Bob was co-chair of the Federation of Small Anthropology Programs in the General Anthropology Division of the American Anthropological Association (2002-2006). He served as Secretary-Treasurer, President-Elect, and is President (2016-18) of the General Anthropology Division, the fourth largest section of the American Anthropological Association. As chair of the university-wide Global Awareness Committee, he led efforts to internationalize the campus and curriculum with the Global Studies major and the Global Perspective graduation requirement, coordinated the interdisciplinary majors Comparative Cultures and Global Studies, and supervised minors in Cultural and Biological Anthropology. He is a charter member of Alfred University's chapter of Phi Beta Kappa. In January 2005, and January 2009, he initiated and led faculty-student trips to Belize. He chaired the Division of Social Sciences from 2008-11. In August, 2001, two weeks before 9/11, Bob delivered AU's Opening Convocation address, "Examining Violence in Our World."